BOSTON — August 13, 2018 — This summer marks the 50th Anniversary of Special Olympics, the international sports health organization dedicated to providing athletic training, competition, and resources for millions of disabled people and their families. It’s founding by Eunice Kennedy Shriver in 1968 was profoundly influenced by the tragedy of her intellectually disabled sister and her closest sibling, Rosemary, whose botched, forced lobotomy forever scarred the Kennedy family. Horrified by what happened to Rosemary, Eunice turned her love for her sister, and her frustration with the stigma of disability, into a lifelong passion to alleviate the struggles facing physically and intellectually disabled people and their families. Rosemary Kennedy’s life story and her inspiration to her famous and powerful siblings remained obscured and hidden for decades. Rosemary: the Hidden Kennedy Daughter, by Kate Clifford Larson, reveals a different perspective on the Kennedys, one that places Rosemary at the center of a dynamic family narrative, where she belongs. Rosemary, the eldest Kennedy daughter, attended exclusive schools and was presented as a debutante to the Queen of England. But, she was later hidden away because of frustration with her intellectual disability and intensifying mental health issues in her teens and early twenties, and eventually hospitalized and lobotomized at age twenty-three. In Rosemary, this differently abled child comes alive, as a sweet, lively girl adored by her siblings, who would later dedicate themselves to plight of the physically and mentally disabled. Rosemary’s story still resonates today because it shows us how much we as a culture have evolved in regards to the education, treatment, and accommodation of people with disabilities and mental illness – and reminds us of the obstacles that the disabled and their families still face. Rosemary’s life was marred by horrific tragedy, but it is within that story of heartbreak that readers find an enduring image of a loving young woman who changed her family, transforming the lives of millions. 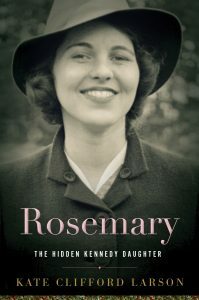 A New York Times bestselling author and Editor’s Choice pick, Kate Clifford Larson has earned rave reviews and high praise for her “haunting” and “heartbreaking and illuminating” biography of Rosemary. She has received numerous awards and citations, including the 2016 Massachusetts Book Award in Non-fiction for Rosemary, and named one of People Magazine’s top-ten books of 2015, and one of BookBub’s best biographies of all time. Larson is also the critically acclaimed author of Bound for the Promised Land: Harriet Tubman, Portrait of an American Hero (2004), optioned by HBO for an Original Movie; and The Assassin’s Accomplice: Mary Surratt and the Plot to Kill Abraham Lincoln (2008).